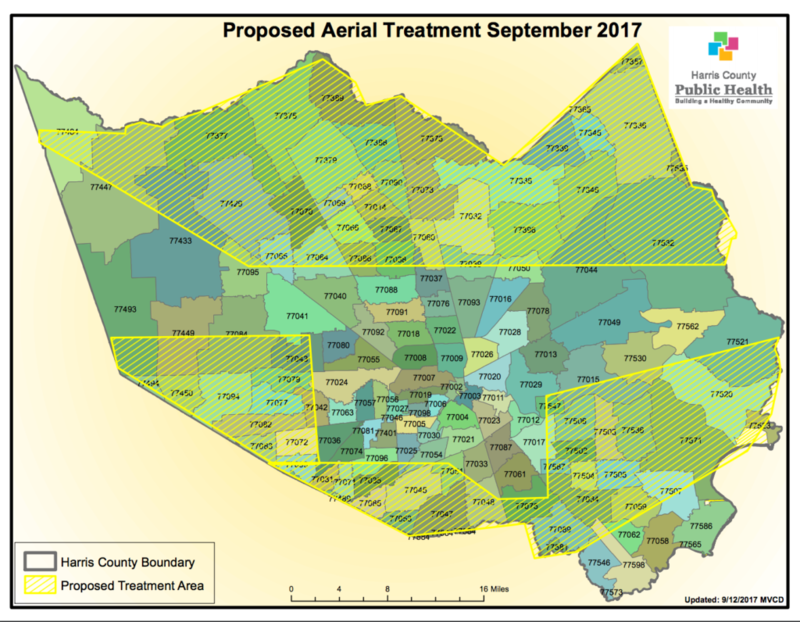 [TrueActivist] The Texas Department of State Health Services and Harris County Public Health have teamed up with the U.S. Air Force to spray an estimated 6 million acres with an insecticide to curb the outbreak of mosquitoes. The Pentagon announced last week that the Air Force Reserve’s 910th Airlift Wing had been dispatched to “assist with recovery efforts in eastern Texas,” and these efforts consist of using C-130H Sprayers to kill mosquitoes and other insects. Following natural disasters that involve large amounts of water, such as Hurricane Harvey and the ensuing flooding that occurred, all standing water becomes the perfect place for mosquitoes to breed. Female mosquitoes lay their eggs on stagnant water, or somewhere the water will rise and cover the eggs to stimulate hatching, and the beginning of life for mosquitoes is dependent on the water. All of this and the fact that Texas has the perfect hot climate that mosquitoes thrive in has led to concerns that mosquito-borne diseases could become a serious problem in the days, weeks, and months to come. The spraying began over the weekend and is set to continue for the next several weeks. Approximately 1.85 acres had already been sprayed as of Tuesday, and the area of coverage may expand as rescue efforts continue. As citizens become concerned for their health due to the complex reputation of insecticide use, Texas officials are pointing to both the amount of mosquito-borne diseases they have had in the past few years and the success of spraying campaigns following Hurricanes Katrina and Rita. Texas reported 441 cases of West Nile virus and 21 deaths since the start of 2016, according to figures released on Tuesday. The figures also revealed that 342 cases of Zika virus had been reported during that same time period, including one that likely started and spread from a mosquito bite last year. Those with concerns for their health should stay inside their homes, if possible, at night when the aerial spraying occurs. Beekeepers should cover their colonies to prevent their bees from leaving and being exposed to the insecticide, which will be Dibrom, because insecticides have been shown to be lethal to bees. While some feel safe with the decision to do aerial spraying, others are pointing to the neurotoxic effect that many insecticides have on both humans and animals. They argue that mosquito-borne diseases are less of a concern for the public than such effects, but there is little that can be done now to stop the spraying, which is likely already halfway completed.